And now we come to The Name of the Star, which is an interesting case. I had started this before, quite some time ago. It didn't grab me then, for reasons I can't quite figure out. Because this time around it grabbed me good, and I finished it in two days. I am a Maureen Johnson fan. I follow her on Twitter, which has been one of my better social media moves ever; she's informative, and endlessly entertaining. I believe I reported that I even purchased Suite Scarlett stone-cold solely based on her social media presence, completely on impulse, and did not regret it one bit. I've been eager for The Name of the Star since she announced it was coming; I wanted to see her take on the supernatural. And who is not a little intruiged by Jack the Ripper? In brief summary: Rory is from very small-town Louisiana, travelling with her lawyer-professor parents for a year's sabbatical in England. While her parents are off to Bristol, she has been accepted to Wrexford, a residential school in the heart of London. 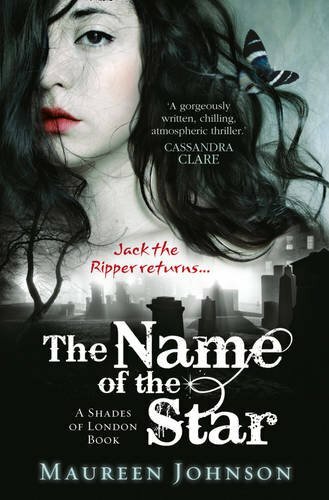 In the heart of Jack the Ripper's territory, to be precise, which turns out to be a bit of a problem when a copycat killer appears the day before Rory arrives. What's worse is that Rory sees the killer -- and discovers that no one else can. And I like it. That maybe goes without saying. The thing is, if you like Maureen Johnson's other stuff, you will like this, even if you're not a fantasy fan. Because what makes this book great is not the interesting world-building things she's done (which is all seamlessly integrated, and works quite well) but the things that she does best: characterization and just damn fine writing. Maureen Johnson makes writing look easy. (It's not, I know -- this Nanowrimo pep talk being one of my favourite bits of writing about writing). The story, from plot to characters to incidental detail, appears effortless, making for an easy read without being a brain-dead one. I don't think I picked out a clumsy exposition or clunky sentence in the lot. I like her style, too; I'm not sure I can point out why, exactly, because that would require more brain power than I have currently. Suffice to say that her turn of phrase is concise and clear, often funny, perfectly descriptive without being purple, and never cliched. And her characters. In Rory, our main character, we have a sympathetic protagonist, an outsider who is friendly with most but not popular, who is smart but not a genius, who is not preternaturally brave or capable. In other words, she's very ordinary, but with enough flavour that she's not a blank slate. I like her development and her responses to the things -- sometimes very strange, frightening things -- that happen to her; it feels organic and realistic. She doesn't roll with the punches, because that would be unfaithful to the character even if it might have furthered the plot; she is traumatized and Johnson handles that beautifully. I also love Rory's wry, observant inner monologue. The other characters that crop up are necessarily not as well-developed as Rory, since [the lion's share of] the book is from her limited perspective, but they're distinct and interesting and feel like real people. As I noted for Suite Scarlett, too, Johnson manages to comment quietly on some social and cultural things without being preachy -- here, her target being both the CCTV surveillance culture in London and 24-hour sensational mass media. She never investigates either thing explicitly or deeply, but it's an integrated part of the story, leaving the reader to ponder these things without feeling like she's been delivered a blatant public service message. The start is slow; we spend a lot of time getting to know Rory and her friends, which works really well -- it makes the increasing threats to Rory and her world that much more alarming. It allows us to get settled into place, with just hints of the tension that absolutely explodes somewhere around the last third of the book. While the trademark MJ humour is still present, it takes a back seat to the suspense as the tension ramps up, never entirely disappearing but the seriousness of the situation is never undercut. I won't lie: this book kept me, a sleep deprived human being, up past my (admittedly fluid) bedtime even after I'd stopped reading for the night, worrying about what was coming next. Perhaps not the smartest choice of reading material for me to make. No regrets, though -- this book was definitely a good ride and a great read. ... Aaand, now to bed, I think, since apparently writing about the book is going to keep me up too. No promises as to when the next review will come up, and I'm really barely online these days to even comment on other blogs. I miss you all, and plan to be back when I can. Sounds great! Mostly I'm excited to see a review (not that I can talk, my blog is sadly neglected too, and I don't have a baby to blame it on). Hope you get more sleep soon. It's nice to see you back, and arguing so persuasively on so little sleep that you have made me want to look for this book. Hi Jeanne! I'm glad that there's still some brain cells firing, that's for sure. Hope you enjoy this one! It's definitely good fun.